Comfort food is most often associated with winter, when the wind is blowing and the snow is flying and the temperature is on the nippy side, usually below zero. But there can be times when the weather is nice, perhaps with temps in the 70s or 80s, that a hearty meal really hits the spot. That’s where I found myself recently after putting in a few hours in the garden, where I worked up an appetite for more than a bowl of soup and a sandwich, a casserole or burgers and such. 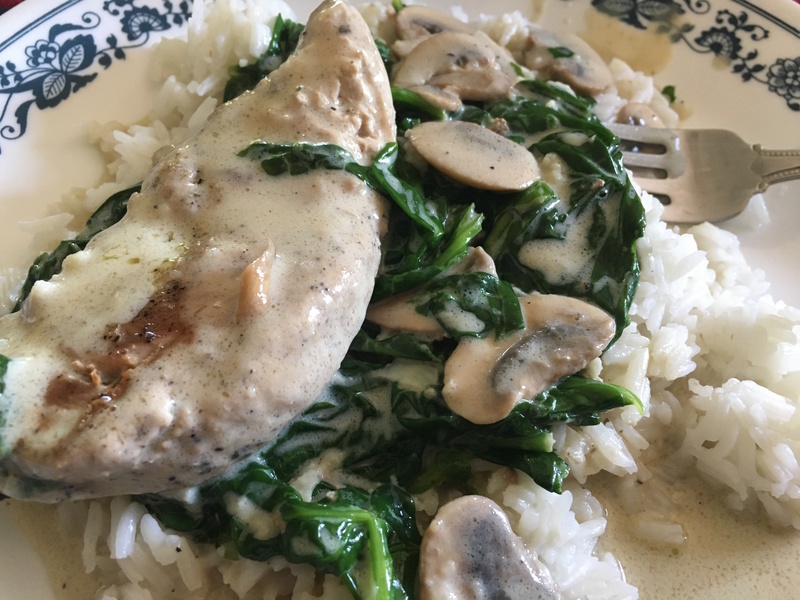 What I came up with was a combination of chicken (in my case pheasant), mushrooms, spinach and a rich, garlicky cream sauce that took just 10 minutes of prep time and 20 minutes in the skillet before it hit the dining room table. If you are looking for a comforting, satisfying and tasty entree, this dish is for you. In a large skillet, add olive oil and cook the chicken on medium high heat for 3 to 5 minutes on each side or until brown on each side and no longer pink in center. Remove chicken and set aside on a plate. Add the sliced mushrooms and cook for a few minutes until tender. Remove and set aside. To make the sauce, add the butter to the skillet and melt. Add garlic and cook until tender. Whisk in the flour until it thickens. Whisk in chicken broth, heavy cream, Parmesan cheese, garlic powder, pepper and salt. Add the spinach and let simmer until it starts to thicken and spinach wilts. Add the chicken and mushrooms back to the sauce and serve over rice.